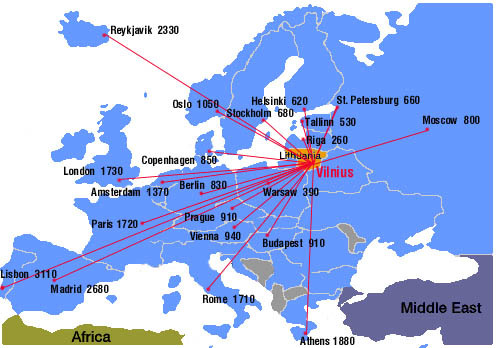 The distances from Vilnius, Lithuanias capital, to various European cities, in kilometres. Location: on the Eastern shores of the Baltic Sea. Largest cities by population: Vilnius 580,100; Kaunas 418,700; Klaipeda 203,300; Siauliai 147,000; Panevezys 133,300. National and official language: Lithuanian, an ancient Indo-European language of the Baltic group. Lithuanians use a Latin-based alphabet of 32 letters. Head of State: President Valdas Adamkus elected for a term of five years took oath on 26 February 1998. National Assembly: Seimas (Parliament), 141 members, elected every 4 years. Chairman of Seimas: Ceslovas Jursenas. Population (1996): 3,711,900. - Distributed between urban 2,518,400 (67.85 % ), and rural 1,193,500 (32,15 % ). Ethnic composition: Lithuanian 81,3%, Russian 8,2%, Polish 6,9%, Belarusian 1,5%, others 2,1%. Religion: Predominantly Roman Catholic (estimated 80 % ). Others - Russian Orthodox, Evangelical Lutheran, Judaic, etc. Population density: 56.8 per 1 square km. Chief products: Agriculture, forestry, fishing. Light industry. Area: 65,300 square kilometres (25,212 square miles), about the size of West Virginia. Greatest distances: East-West 336 km, North-South 292 km. Highest points: Juozapine (293.6 metres), Kruopine (293.4 m), Nevaisiai (288.9 m). Major rivers: Nemunas (937.4 km), Neris (509.5 km). Largest lakes: Druksiai (4479 ha), Dysnai (2439.4 ha), Dusia (2334.2 ha). Altogether, there are 2,830 lakes larger than 0.5 ha in Lithuania, covering a total area of 880 sq. km. Climate: Temperature, between maritime and continental. Mean annual temperature 5 degrees Celsius (41 deg. F). Average January temp. in Vilnius - 4.3 deg. ; July average 18.1 deg. C. Annual precipitation 577 mm in Vilnius, 739 mm in Klaipeda. Humidity: 78%. National currency: Litas, equals 100 centas. Exchange rate (approx. ): 3.45 Litas equals 1 Euro. Sources: LR Gvt.s Statistics Department, Lithuanian Heritage, TUULSS. © Institute of Mathematics and Informatics, 1998-2000.